Ecology has been given an important place in the state during the last few years. Industries which cause water or air pollution are not encouraged. Every industrial project has to obtain the clearance of the Environment Protection Organization before its establishment. Himachal has to face many difficulties in the advancement of Industries. Lack of adequate and dependable means of transport was one of the main drawbacks. Other handicaps were the poor mineral resources of the state, non-availability of infrastructural facilities, shortage of capital and equipment, absence of modern skills and lack of entrepreneurship among the locals and over emphasis on cottage industries. One of the advantage was the availability of ample electricity. It is attracting entrepreneurs from the neighbouring states which are starved of power. With a view to develop industrialization, a new industrial policy was adopted by the government providing various incentives such as cheaper power, 25% subsidy besides easier credit facilities through the State Finance Corporation and the nationalised banks for setting up new industries. Land was made available on 99 years low rate lease basis and new industries were exempted from sales or purchase tax and from octroi both on raw material and finished goods for 5yrs. Concession was given on freight charges for transport of raw materials from the nearest railhead outside the state besides provision of other marginal benefits such as assistance in the preparation of project reports. These concession helped in establishing industrial houses in the state. Industrial areas have been established at Pauranoo, Barotiwala, Baddi, Paonta Sahib, Mehatpur, Shamshi, Nagrotu Bagwan, Bilaspur, Reckong-Peo and Sansar Pur Tera. As the dust free and cool climate of Himachal is extremely suitable for the establishment of electronic and precision industries, many electronic complexes have been set up at Solan, Mandi, Hanurpur, Shogi, Raga-Ka-Bagh, Chamba, Ambi, Taliwala and Keylong, like watch manufacturing units, thermometers, microscopes, hospital and laboratory equipment. Facilities available for setting up electronic industry for which a subsidy up to 50 lakhs is given, has encouraged manufactures to set up TV sets, tape recorder, video-cassettes, electronic toys and computer parts industries. Furniture making, rope making, bamboo products, manufacturing and specialized wood based industrial units have also been set up. Two vanaspati ghee plant have been set up where limestone exists in plenty, cement factories have come up in public and private sectors. Private sector industries are doing well. But in the public sector, with the exemption of country liquor bottling plant and turpentine factories, others are running at a loss. Sericulture, handloom and tea are other industries that have lately been given particular attention. Silk industry is providing employment to a lot of people. 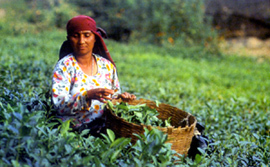 Tea is traditionally grown in Kangra and Mandi district at an altitude of 1000 to 1500 metres. With a view to encouraging this industry, subsidy is being provided to growers besides facilities for chemical analysis and co-operative tea processing in a factory. The Tea Board of India has given financial assistance for laying out demonstration plots and for undertaking research. Himachal has a rich heritage of handicrafts. These include woolen and pashmina shawls, gudmas, carpets, silver and metal ware, embroidered chappals, grass shoes, Kangra and Gompa style paintings, wood work, horse-hair bangles, wooden and metal utensils and various other house hold items. These aesthetic and tasteful handicrafts declined under competition from machine made goods and also because of lack of marketing facilities. But now the demand for handicrafts has increased within and outside the country. The Himachal Pradesh Handicrafts corporation is implementing schemes for the revival and rehabilitation of handicrafts. Apprenticeship schemes aiming at training in almost extinct crafts like Kangra and Compa painting and metal wares were undertaken. The handicrafts design centre was set up to provide new design adaptations to the artisans. The corporation has introduced a procurement scheme under which master craftsmen are provided work at their door steps and the finished goods are collected from them and marketed. Himachal is poor in minerals. The state accounts for only 0.2% of the output of minerals in the country. There are some limestone, building stone, slates, gypsum and rock salt deposits which are commercially valuable. Other than that, there is nothing much of significance.